Dedicated Transport We operate our own fleet of over 40 delivery vehicles nationwide. Providing next day delivery, direct to site. Online Ordering You can now order online 24/7 from a computer, smartphone or tablet. Extensive Product Range Including care showers, wet room formers, shower trays, sanitary ware, shower screens, grab rails and shower seats. Customer Support Services Our technical helpline team is made up is made of experienced ex-installers and plumbers. Happy customers are key in your line of work to attract repeat business, but you also need to ensure you can complete jobs quickly and easily while maintaining exceptional quality. Critical to this are cost-effective yet high-quality specialist kitchen and bathroom products that have been developed with both the installer and end-user in mind. 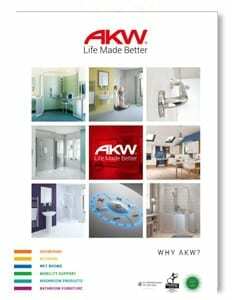 At AKW, we understand the installation process and have designed our wide range of stylish, high-performance products to ensure fast and simple fitting with minimal specialist tools to help you work efficiently. Every one of our products is designed, tested and certified to be the very best. That’s why we can offer a ‘no quibbles’ return policy and Lifetime Warranties on many of our products and you can be confident that we’ll always be there to honour it.